I spend a lot of time working with large organisations and talking to individuals. It is often the perception of these individuals that they are not listened to. Note I used the word perception because it is not a statistic one can quote. It is hard to say you shared 7 ideas and none were implemented. But in a time of change we need to improve communication by a factor of 10 so why do people not feel listened to even when as senior managers we are spending more time on the floor and talking to more people. Could it be we are not having the right level of conversation? In the work place we converse with people to gain knowledge, people feel listened to when you and they have learnt something new. The question is then how do we share knowledge, how do we promote a work environment where knowledge is not something that is owned but something shared? We need to start having the right level of conversations. Initially the conversation is focused on ritual, in the UK this is normally a discussion about the weather. Have we learnt anything? No. We then move to facts and information trading, this is broken, we did not achieve the numbers, it is all safe sharing of information because there is data to backup what is being discussed. Plenty of conversations I see every day stop here but neither party has learnt anything new so no-one feels listened to. To improve our knowledge we must get past this, we must move into the risk area, we must seek opinions. This is hard for people because no-one wants to be told they are wrong. 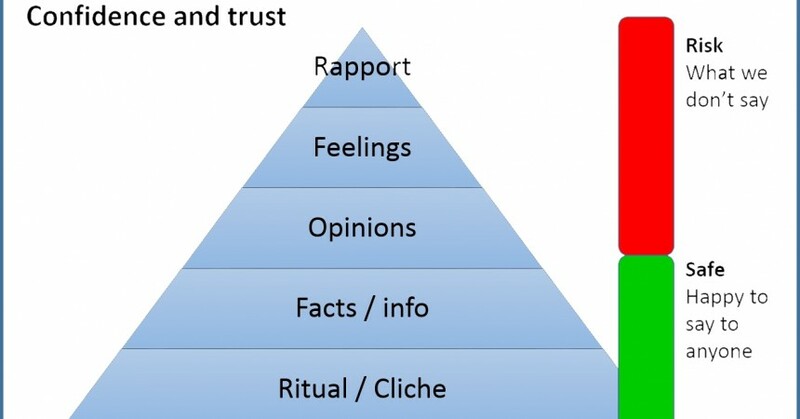 If you build the trust of someone and you start to hear their opinions you can actually start to learn what is happening and work together to validate or change opinion. We then move into feelings, we have to share how we feel about a situation in order to learn and also to feel listened to and we have to do this before we build rapport and trust with individuals. 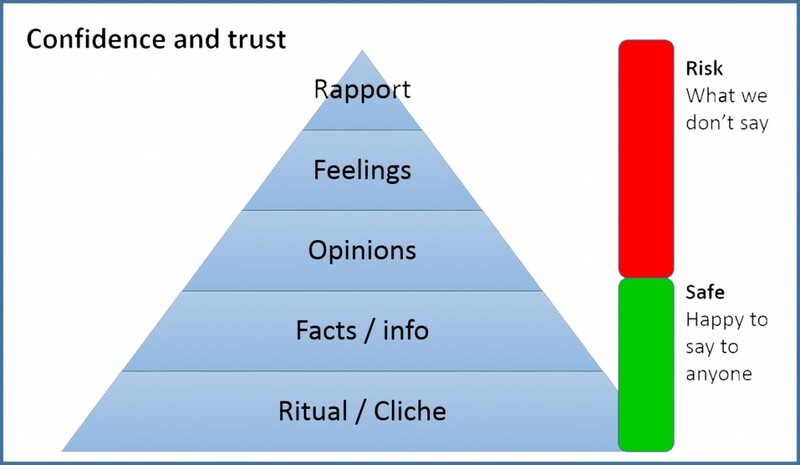 Trust is what we need from all individuals, without trust change will not be transformational without rapport we will not convince people they are listened to. When was the last time your conversations gained rapport with your team and they truly felt listened to?